This Sunday, works of art will take over the streets of downtown Wheaton for the Wheaton Art Parade. Now in its second year, the parade is a sign of how communities in Montgomery County are finding new uses for vacant suburban retail spaces. One of the sculptures in the Art Factory, the former mall beauty school where pieces in the Wheaton Art Parade are stored. All photos by the author. Earlier this month, I stopped by the Art Factory, a former beauty school behind Wheaton Plaza. Nestled between mannequins and barber’s chairs are giant sculptures, including a rainbow-colored chicken and a robot. 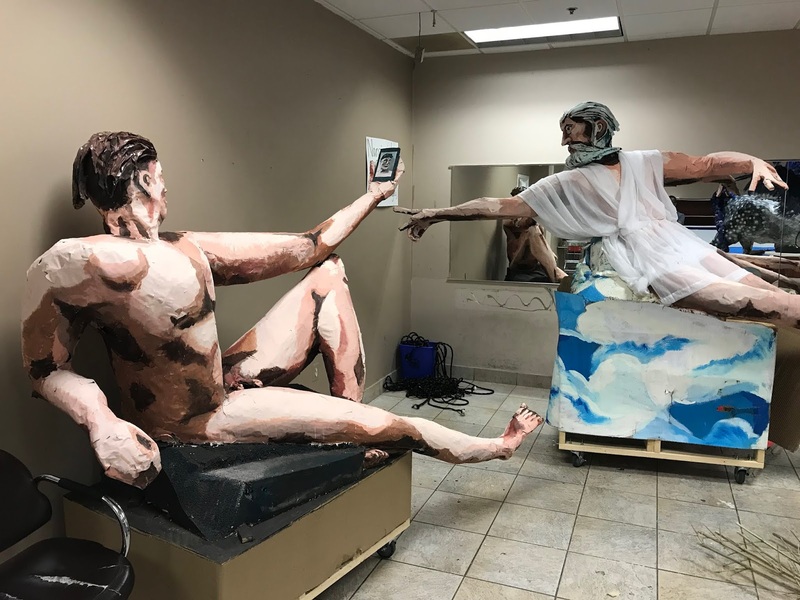 A piece called “Narcissus” riffs on Michelangelo’s Creation of Adam by putting a smartphone in Adam’s hand as he takes a selfie. Like the first parade last September, this parade features work by a mix of professionals and volunteers, as well as students and teachers at Einstein High School. Over 1,500 people turned out last year, including 300 people who walked in the parade itself, each carrying a piece of artwork. As this is an election year, politicians are allowed to march, but only if they hold art. “Anyone can march for art, you just have to carry it, wear it, or pull it,” says Thompson. Outside the Art Factory, a former beauty school at Wheaton Plaza. The Wheaton community has come together to support the parade, which has a budget of $40,000. The Arts and Humanities Council of Montgomery County provided a grant, and several local businesses have sponsored it. But Westfield, which owns Wheaton Plaza, has become a significant partner as well. The Australian-based company donated the space for storage (the artwork is assembled elsewhere) as well as some funding, and has displayed parade floats in the mall. 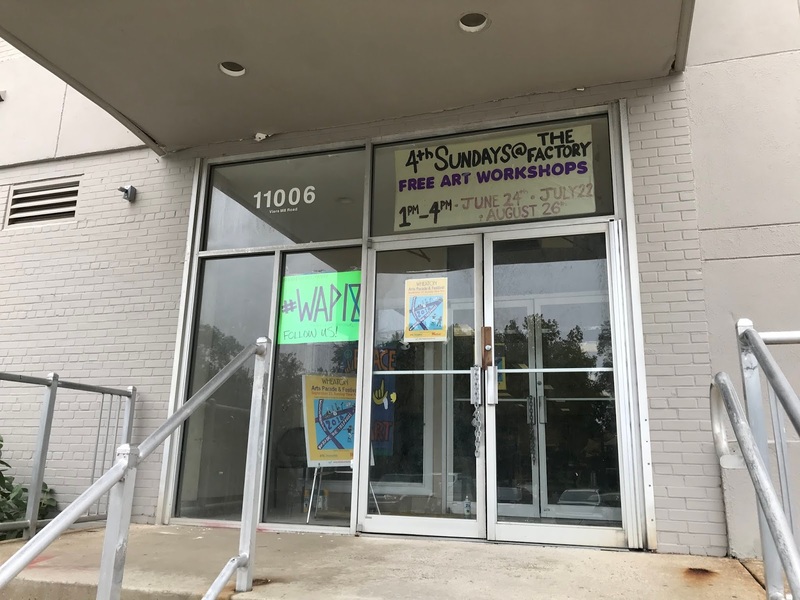 Jim Epstein, an actor and volunteer with the Wheaton Art Parade, hopes it will raise awareness about the need for art galleries and performance space in Wheaton. Montgomery County is currently studying whether to build a cultural arts center, which could host both of those things. “When you change the perception of Wheaton as an arts-friendly town, it’s good for business,” he says. Like many aging suburban communities, Montgomery County has a significant amount of vacant commercial space, due in part to changing shopping habits and companies seeking more urban locations. In recent years, many of these spaces have hosted art exhibitions and performances. One of the pieces at MoCAT, the pop-up museum created by students at Bethesda-Chevy Chase High School. Last fall, The Museum of the Contemporary American Teenager (MoCAT) briefly took over a former Japanese restaurant in Bethesda that was awaiting demolition. Students at Bethesda-Chevy Chase High School produced a mix of visual pieces and interactive displays, as well as a series of talks on current affairs. Unjuried art festival Artomatic took over a vacant office building in Park Potomac in 2016, while a visual arts festival occupied three floors of an office building in Pike + Rose. Each of these events allowed local artists to show off their work in their own community, as opposed to traveling to DC or another major city, while helping to build a local cultural scene.